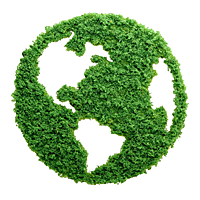 The new Heil® Ultra-Low NOx 80 percent AFUE gas furnace is here and it's built to provide consumer comfort with dramatically reduced NOx emissions. With 65 percent less NOx emissions than current low NOx models, the Heil Performance Series N80ESU Ultra-Low NOx furnace is a more environmentally-friendly choice designed to meet or exceed the ultra-low NOx emissions requirements for California's SCAQMD Rule 1111 and SJVAPCD Rule 4905. Meets or Exceeds New Requirements: The Heil Performance Series N80ESU Ultra-Low NOx gas furnace meets or exceeds California's SCAQMD and SJVAPCD stringent ultra-low NOx emissions of 14 nanograms/joule NOx. Efficient: This new Heil gas furnace achieves 80 percent AFUE heating efficiency and includes a tapped ECM blower motor for system SEER, which can help reduce electricity costs. Dual Fuel Compatible: Customers can pair the Performance Series N80ESU furnace with a Heil heat pump and compatible Heil thermostat to create a dual fuel system. The ability to automatically switch between electric and gas heating can be a great defense against unpredictable utility costs. Prepare for New Standards: Install Heil Performance Series N80ESU Ultra-Low NOx furnaces prior to the October 2019 deadline for California's SCAQMD and SJVAPCD ultra-low NOx emissions standards, and be better prepared for the new furnace requirements. Compatibility: The Heil Ultra-Low NOx gas furnace is compatible with Day & Night programmable thermostats, current Performance Series and most QuietComfort® air conditioners and heat pumps. It's a more environmentally-friendly choice. It's customer-friendly. 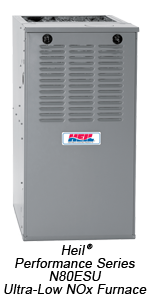 It's the new Heil Performance Series N80ESU Ultra-Low NOx gas furnace. It provides warm winter heat with 65 percent less NOx emissions than current low NOx models, and it's designed to meet or exceed California's SCAQMD and SJVAPCD ultra-low NOx emissions standards.